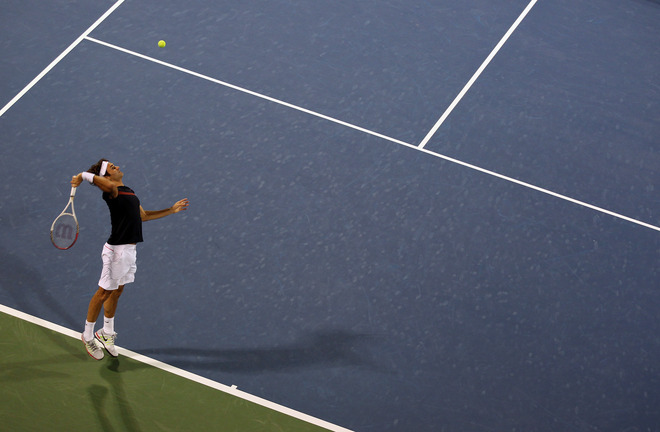 Marking the 20th anniversary of the Dubai Duty Free Tennis Championships, the tournament was voted best ATP 500 event on tour for 2011. Roger Federer began his campaign with his 30th victory of the tournament. He faced Michael Llodra on Tuesday night, and in just 17 minutes, the Swiss maestro won the first set 6-0. The second set was a much tighter contest, with Llodra serving very well and putting pressure on Federer by often coming to net. The set would be decided in a tiebreak. Federer saved one set point with a precision forehand in the corner, and two points later clinched the match with a backhand flick up the line. With that, the four time champion is through to the second round after a 6-0 7-6 (8-6) win over Llodra in 1 hour 7 minutes. The Swiss maestro served seven aces although serving at just 46% for the match. His next opponent is another lefty in Feliciano Lopez.